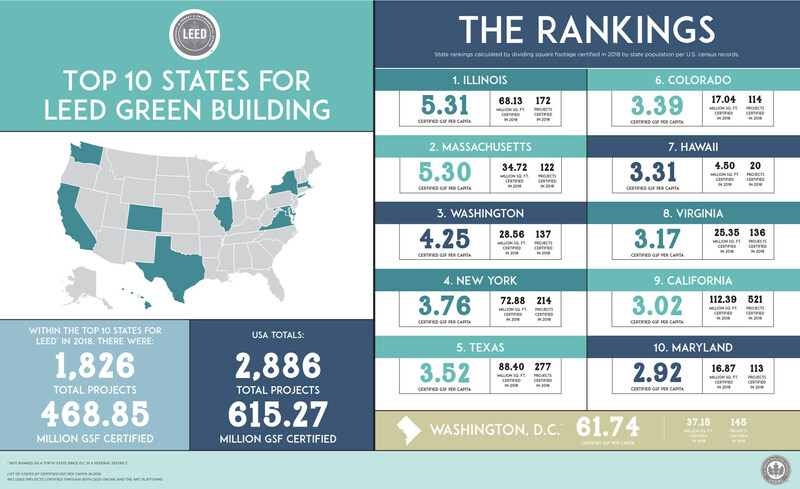 Illinois topped the U.S. Green Building Council’s (USGBC) annual ranking of states for LEED (Leadership in Energy and Environmental Design) green building, followed by Massachusetts, Washington and New York. The ranking reflects the number of LEED-certified square feet per capita in a state. In 2018, Illinois certified 172 LEED projects for a total of 5.31 square feet of LEED-certified building per person. It marked Illinois’ first time topping the USGBC ranking since 2015. Overall in the United States, there were 2,886 total LEED projects, for a total of more than 615 million square feet of building space. The annual USGBC ranking reflects a diverse mix of states, both geographically and politically. Washington and Texas both notched their highest LEED square footage totals, and Colorado made a significant jump from 10th place in 2017 to 6th this year, with 114 LEED projects. USGBC notes that Washington, DC would have had the highest ranking with 61.7 green square feet per capita, but it is not included because it is not a state. Illinois’ top ranking is an acknowledgement of several successful projects, including certification of the Willis Tower as LEED Gold for some efficiency upgrades. Chicago has made green buildings a hallmark of its sustainability efforts, with a goal of powering its more than 900 city buildings with renewable energy by 2025. The voluntary Retrofit Chicago has led to 90 participants slashing total energy use by 17%. Last year, Chicago was one of seven cities to get USGBC’s LEED for Cities Platinum certification, the highest offering to a city. As cities and states ratchet up sustainability goals — in part to meet the U.N. Paris climate change accord in the absence of federal leadership — green building codes have emerged as a key strategy. A survey commissioned by the U.S. Conference of Mayors and the Center for Climate and Energy Solutions found that 70% of cities surveyed have set energy efficiency goals for new and existing buildings, and some have set demanding goals for making municipal buildings more efficient. There is some overlap between the USGBC’s top states and cities; nine of this year’s top 10 states are also home to LEED-certified cities like Seattle and Austin, TX. But success on the state level — and policies that push states to adopt green building codes — can push cities to go farther.